Simply pass your friend’s contact details to us or ask them to mention your name when they contact us. 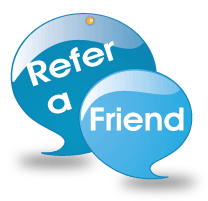 As long as we can identify you (and/or your account) from your friends ‘Recommended by’ new customer registration form we’ll credit $50 to your account at the same time as your friend pays their invoice for their set-up costs and their 1st years subscription. It’s that simple. And we’ll do this EVERY TIME someone mentions your name when they create a new account. There’s no limit. This offer is not valid in conjunction with other offers from Crystal Payroll.